Gone are the days when the very thought of devices communicating among themselves to carry out specific and intricate tasks—without any human intervention—was considered to be merely a part of science fiction. Technology evolution, in the last few decades, has been astounding. The gadgets James Bond so flaunted are no more just a concept but are well within arm’s reach. Two technologies, in particular, to have epitomized this advancement are the cloud and the Internet of Things (IoT). In the last five years alone, the growth of IoT has been meteoric. There is a diverse amount of devices which are being conceived to be an integral part of the IoT. Estimates show that by the year 2020, the “Things” that are specifically produced for IoT would be numbered at roughly 13 billion. Even though many see IoT as the epicenter of the next great industrial revolution, the very dependence of these “things” on the internet would come as a major hiccup or obstacle even, in realizing its full potential. As long as the ‘I’ in IoT dictates the working of devices, there is no next level as such. But can this be avoided? Can IoT function without the internet? Then such questions linger, putting everyone in a dilemma, mesh computing emerges—a network topology which would not require internet in order to transfer data. This means, not only can the dependency on the internet be reduced, the ‘I’ in IoT can be entirely eliminated in certain circumstances. Before we decide to eliminate the internet and explore more about mesh computing—the potential answer to the future of connected devices—let us understand as to why the internet will lead to the stagnation of this technology. For instance, consider connected cars, which is another exciting idea that may well help reduce the chances of accidents to a bare minimum. These cars need cellular connectivity, which is expensive since the chips purpose-built for this require certification and cost millions of dollars—making cost a big barrier for the smaller companies. This is not helped by the fact that even though people invest in connected devices, they are unwilling to buy a data plan and expect the companies to provide free internet services. One can argue that for a car manufacturer, providing data services is not an issue and they are fair in thinking that. But what happens when people start expecting the same from the smaller companies? Like those that make thermostats or specialized health monitors? For such firms, this additional cost of data would be too big a burden to bear. Add to this the potential security issues and data breaches which are very common in the world of internet. Mesh networking would be a welcome change to all of this, making life much easier, especially for smaller enterprises. So What Exactly is Mesh Computing? Mesh computing or mesh networking is a network topology in which each radio node relays data for the network. The Internet is not involved what-so-ever. The communicate takes place from node to node and all the mesh nodes cooperate in the distribution of data in the network. 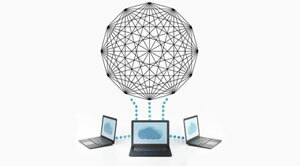 Mesh networks can relay messages using either a flooding or a routing technique. Flooding is a simple computer network routing algorithm in which every incoming packet is sent through every outgoing link except the one it arrived on. Whereas with routing, the message is propagated along a path by hopping from one node to another until it reaches its destination. To ensure all the paths are available for the message to travel, the network must allow for continuous connections and must reconfigure itself around broken paths, using self-healing algorithms such as Shortest Path Bridging. Self-healing allows a routing-based network to operate when a node breaks down or when a connection becomes unreliable. As a result, the network is typically quite reliable, as there is more than one path between a source and a destination in the network. Using autonomous local meshing, the efficiency of the network is improved. Data from IoT devices like thermostats, appliances, and connected devices in the home can now be sent to each other without internet connectivity. Since there is no cloud involved to store the data, the security concern is also reduced multifold. Although mesh has the ability to merge and aggregate data from multiple users, the individual identities remain uncompromised. All things considered, it seems that wireless mesh is the answer to taking the fourth industrial revolution to its next level—a world where life is much simpler since devices are completely automated, prioritizing human comfort and safety. By integrating the scope of mesh computing, enterprises will be able to streamline their processes and bring more value to the organization.